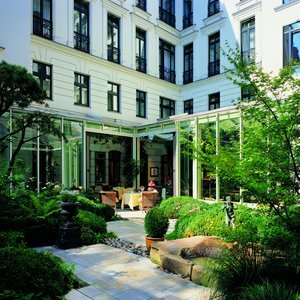 Roman architecture, attention to detail and rooms with modern and chic ambience provide guests with a peaceful alternative to stay in Berlin. The Brandenburger Hof Berlin has 72 guest rooms with a safe for valuables, iPod docking stations and the hotel offers shuttle service to and from the Tegel airport. 2 restaurants, snack bar with deli and a cafÃÂ© are available for your leisure, with a courtyard cocktail garden serving drinks. Relax and unwind with an indoor pool, health club, sauna, and steam room. Guest rooms at Brandenburger offer views of the city, garden, or courtyard. Each room includes separate sitting areas, a desk and minibar. Wireless Internet access is available for a surcharge, with satellite channels and complimentary bottled water in each room. Guests may request in-room massages, hypo-allergenic bedding and ironing supplies. Unique Eislebenerstrasse location allows easy access to the Theater of the West and Berlins Hard Rock Caf. The U-bahn is easily accessible at Augsburgerstrasse with the Berlin Zoo/Aquarium within twelve minutes of walking distance, while the Technical University of Berlin is a twenty minute walk where you can find a nice walking along the river Spree. Just a few blocks away from KaDeWe department store, yet the hotel is on a very quiet residential street.